Come for a Tuesday, Wednesday, Thursday or Friday evening cruise on one of our luxury double decker passenger boats. Bring your friends and family and relax with a glass of wine or beer from the well stocked bar, admire the beautiful scenery of the Norfolk Broads at dusk and watch the sun set as you tap your feet to the music. 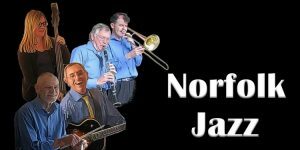 The ever-popular Norfolk Jazz Quintet, formerly known as the Norfolk Dixieland Jazz Band, return to Broads Tours this year for their evening jazz cruises on the Vintage Broadsman, but this year they are playing every Tuesday in July and August! Evening Cruises depart from and return to Broads Tours, The Bridge, Wroxham. Trips board at 7:15pm, depart at 7:30pm and return to Wroxham at 10:00pm. Booking essential, please telephone 01603 782207. Online booking coming soon – In the meantime please call 01603 782207 to book. 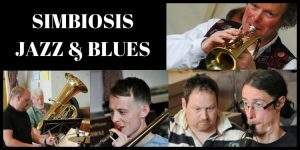 Simply come on board the Vintage Broadsman for an evening of foot-tapping traditional jazz done in a contemporary style, where the Norfolk Jazz Quintet band (formally Norfolk Dixieland Jazz Band) aim to create a memorable and unique evening on the beautiful Broads by engaging with the audience so every evening is different. 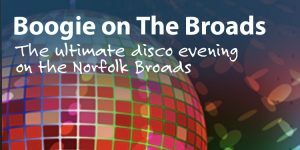 Join Broads Tours for the ultimate Broads Disco experience on board the Vintage Broadsman. Whether you are looking to reach for the stars, twist again or slide your way through the evening this is the night for you.